As an aside, unless the 'guideline' has changed, some thought should be given to a new game thread as we're above 10k ... and are usually the first to get locked when the site gets even a little twitchy. As soon as the Tournament is over I was going to start a new one. Tami, your PM box is full. My Inbox is cleaned up. Cleric, your box is full. It seems to me that Dr. Char Banner is a rather major figure to have never been mentioned until now, in lieu of the groups proximity to Jinzi. Also, slight nitpick, but regarding the state of Capsule Corp after Sheriff Zaofan's assassination attempt, how's R&D still operational? The days are blurring by. But seriously, Char was offsite at a research facility far away in the mountains doing research into Adam until recently. Most of outer CC is still wrecked, but things like the geofront and some of the back labs are fine. But seriously, Char was offsite at a research facility far away in the mountains doing research into Adam until recently. Most of outer CC is still wrecked, but things like the geofront and some of the back labs are fine. Name: Anubis, "The Dog Who Swallows Millions"
Quick, and ferocious the Tulpa, Anubis, relies largely on its size, speed, and strength (relative to its size), to overwhelm opponents. Relying on its claws, teeth, and its ability to 'disappear'; it is capable of rending through flesh and armor alike. Apophis Cannon - After a brief delay, a massive burst of energy is dispelled from the Tulpa's mouth. Shadow Step - Anubis can travel by means of 'blinking' between shadows. Allowing him to appear and strike from odd angles and without warning. Cthonian Dirge - With a howl, Anubis is capable of temporarily stunning an opponent -- who does not exceed his own power level -- briefly. The Maw - Through consumption, Anubis is capable of enhancing his strength briefly. This requires however, that he sink his fangs into a target -- or source of energy -- and actually consume it. Ki Blasts - Your Standardized Ki blasts, fired from the mouth of a Hell Hound. Cthonian Fang & Claw - By coating his claws in the shadows that permeate his form, Anubis can 'infect' a target, once 'infected' the target is then subject to 'shadow attacks'; allowing Anubis to attack at a distance for a duration of (2) in-game posts. Subsequent 'applications' of Cthonian Fang & Claw will increase this duration. Stygian Ephemerality - A being of shadow given thought and form, Anubis is not subject to 'death' in the same way as most entities. Meaning that so long as Ishtar is able to mentally reshape, and reform Anubis with an offering of own blood and energy ... the Dog Who Consumes Millions will live again. Other: ** The Tulpa, a manifestation of Ishtar's psyche given permanence with magic and the Oni's own power, is equal in power-level to that of its "host". It does however, not receive the benefits of the Aka Manah connection, given that it is also, itself, a separate entity. Last edited by Cthulhu_of_R'lyeh; 04-20-2019 at 10:49 AM. Will'o Wisps: creates tiny balls of light that exert no force and just kinda....float around. Arc Flash: Bright focused light beam emitted from the hand. Optical Transmutation: Spell to change eye color. Book of Magic Incantations(Beginner), Novice Wand, Guts. Has an extra ordinary perception of magic, and can visual the forces at work and interact with them on a small scale. A hard working and studious mage in training, who suffered a dismal life as a orphan mage raised by another family. Continuously joked and looked down upon by her classmates, the girl held on to only a shred of hope for her future as a mage.....that was, until a chance meeting with a creature of legend ignited something more in her. Now she works to fufill a promise she made in a chance encounter....a goal she can reach for, even if its as far away as the sun. Currently, she is working on her apprenticeship under Helena Blavatsky...thought how she ended up as a apprentice to that one, and many other mysteries of her new life....are stories yet to be told. 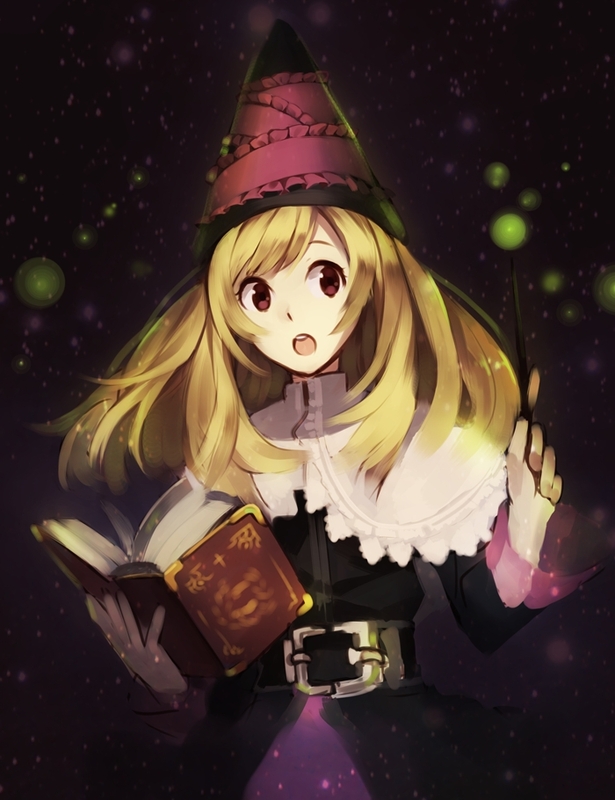 Has a high opinion of Helenas skill as a mage, but a low opinion of her skill as a human being. Has devolved a attachment to mythical beings as a result of her interactions with one oni......and specifically seems to have a fondness for oni like beings. Yet makes no comment on ponies or unicorns.